The above photo is from the gravestone of Frank Augustus Coburn (1861-1908) and can be found in Rose Hill Cemetery, Macon, Georgia. It is of an open book with a cross through a crown inside a circle. Below the circle is ECCLES. XII 1-7. If you look closely, you might be able to make out a series of letters going around the circle. Starting at the top, they are H T W S S T K S.
Quite a lot of symbolism going on here. For that, I always turn to the works of Douglas Keister. Using two of his books, Stories in Stone: A Field Guide to Cemetery Symbolism and Iconography and Forever Dixie: A Field Guide to Southern Cemeteries & Their Residents, we can decipher what some of it might mean. I use the word might because we can rarely be sure of what was going on in the mind of the individual who made the decisions as to what was to be put on any particular stone. We must always remember that. The open book, says Keister: "In its purest form an open book can be compared to the human heart, its thoughts and feelings open to the world and to God." In this instance, the open book may more literally represent the Bible, since the scripture chapter and verses are engraved within. In respect to the cross with a crown, it "is a Christian symbol of the sovereignty of the Lord. When the crown is combined with a cross, the crown means victory and the cross means Christianity. The cross with a crown also denotes a member of the York Rite Masons. 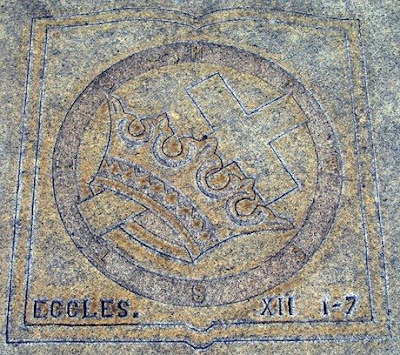 As with all types of crowns used by the Masons, it symbolizes the power and authority to lead or command." Next are the letters. According to Keister, they stand for "Hiram The Widow's Son Sent To King Solomon," and it is associated with the Masonic fraternity. I tried to do a little reading to really understand what that line means, but I must admit I am not really any better off than I was before. The best I can do right now is point you to an "Old South Burial" mailing list entry by Mr. Tom Kunesh. He explains and links to further reading here --> HTWSSTKS. 6Or ever the silver cord be loosed, or the golden bowl be broken, or the pitcher be broken at the fountain, or the wheel broken at the cistern. 7Then shall the dust return to the earth as it was: and the spirit shall return unto God who gave it. All the symbols on this tombstone are related to Freemasonry, ans especially to the York Rite. The book is the Volume of Sacred Law, which is always present in a Masonic Lodge. Most often, the Volume of Sacred Law is a King Jame's Bible, open to different pages according to the degree. The Ecclesiastes XII 1-7 is read during a key moment of the third, or Master Mason, degree, which is the most important degree in Freemasonry (subsequent degrees are not considered higher than the third, they only help to understand the meaning of the three degrees conferred in Blue Lodge Masonry). The letters H T W S S T K S are indeed related to the Mark Master and Most Excellent Master degrees conferred in the Holy Royal Arch Chapters. The crown and the cross form the symbol of the Knight Templar Masonry, considered as the crowning of York Rite Masonry. Note that my observations doesn't invalidate those of the original poster, the most important thing in symbology (and especially in Masonic symbology) is that everyone understands the symbols his own way. This is correct. I am a Master Mason, and will be going through the York Rite shortly. Many brothers at my lodge are in the York Rite, and have shown me different symbols and such, but just like the first three degrees of the Blue Lodge of Freemasonry, there is a lesson to those symbols, and in time, I will learn those lessons. Thanks for weighing in, Jason! Good luck on your journey of learning.